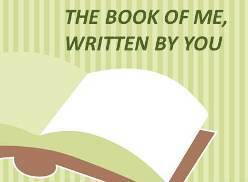 I am participating in The Book of Me, Written By You project created by Julie Goucher of the Anglers Rest blog. The concept: a series of blogging and writing prompts that help family historians capture their own memories and write about themselves. Click here for more information. 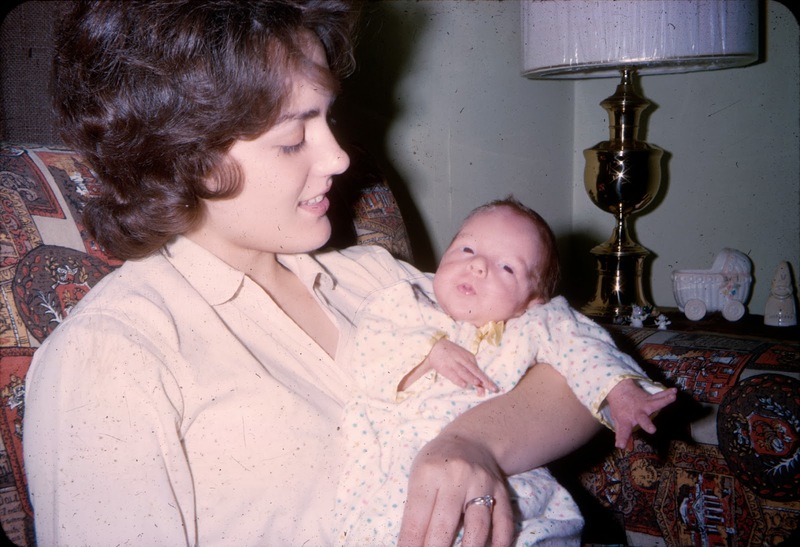 I do have some baby photos. 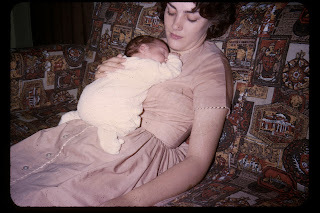 None however from when I was a very newborn baby because I was born about 2 and half months early and had to spend some time in the hospital hanging out in an incubator before being allowed to go home. I always tell people that rather than wait until Christmas to be born I decided to come in time for Halloween, Thanksgiving and Christmas. Here is one to the left where I am just snoozing on Mom. Apparently that was one of my favorite places to sleep. I can totally understand that since I could usually get younger brothers, cousins and even my own kids to go to sleep like that as I was holding them. The one to the right is of Mom just holding me on the couch. These were taken when I was almost two months old. I was born at the Utah Valley Hospital in Provo, Utah where in fact all of my children have been born. However, the hospital is now dramatically different then it was at the time I showed up there. It is now a regional medical center. At the time that I was born you couldn't have all visitors in the delivery room so it was just various doctors and nurses that were there while Dad hung out with the other fathers-to-be in the waiting room...pacing I am sure. Did you have hair? Eye colors? I had a decent amount of dark hair which over time turned fairly light and then back to dark brown as I got older and then started to disappear - or did it just go completely clear? My eyes started out dark brown until my teens and then became more hazel. My wife believes that they change colors based on what I am wearing, as they don't seem to stay a specific shade. No, and probably a good thing that my parents didn't have to deal with two cranky and expensive premies.